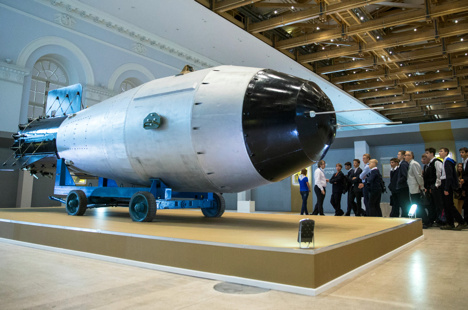 Copy of the Tsar Bomba, the AN-602 hydrogen bomb. Declassified documents reveal the US targeted population centres with high explosive hydrogen bombs, which besides intensifying the Cold War, led Russia to kick start a massive nuclear build-up of its own. A detailed list of nuclear targets and target systems declassified in December 2015 reveals chilling details about US war plans, including the “Systematic Destruction” of population centres in the Soviet Union, China and Eastern Europe. According to the ‘Strategic Air Command Atomic Weapons Requirements Study for 1959’, available at George Washington University’s National Security Archive, major cities, including Moscow, Leningrad, Beijing, East Berlin and Krakow (Poland) were high priorities for atomic bombings. The most disturbing part of the study is a proposal by Edward Teller, the Strangelovian inventor of the hydrogen bomb, to produce a 10 gigaton (10,000 megaton) warhead that would detonate with an explosive power 166,666 times the bomb dropped on Hiroshima. With clinical detachment, Teller illustrated the power of his doomsday weapon: “A 10,000 megaton weapon, by my estimation, would be powerful enough to set all of New England on fire. Or most of California. Or all of the UK and Ireland. Or all of France. Or all of Germany. Or both North and South Korea. And so on.” We are talking just one bomb. On October 30, 1949, Rabi and Enrico Fermi, the man who ushered in the nuclear age, co-wrote a Minority Annex to the GAC report on Building the H-Bomb, recommending against the creation of the hydrogen bomb: “A decision on the proposal that an all-out effort be undertaken for the development of the "Super" cannot in our opinion be separated from consideration of broad national policy. A weapon like the "Super" is only an advantage when its energy release is from 100-1000 times greater than that of ordinary atomic bombs. The area of destruction therefore would run from 150 to approximately 1000 square miles or more. "Necessarily such a weapon goes far beyond any military objective and enters the range of very great natural catastrophes. By its very nature it cannot be confined to a military objective but becomes a weapon which in practical effect is almost one of genocide." Julius Oppenheimer, the father of the atomic bomb, agreed with Rabi and Fermi. He co-wrote in the Majority Annex of the GAC report: “We base our recommendation on our belief that the extreme dangers to mankind inherent in the proposal wholly outweigh any military advantage that could come from this development. Let it be clearly realised that this is a super weapon; it is in a totally different category from an atomic bomb. The reason for developing such super bombs would be to have the capacity to devastate a vast area with a single bomb. Its use would involve a decision to slaughter a vast number of civilians. We are alarmed as to the possible global effects of the radioactivity generated by the explosion of a few super bombs of conceivable magnitude. If super bombs will work at all, there is no inherent limit in the destructive power that may be attained with them. Therefore, a super bomb might become a weapon of genocide. Some members of the US nuclear establishment believed Teller was bluffing. They thought he just wanted to be the centre of attention as a former whiz kid. Rabi said his talk about such a device was an advertising stunt, and not to be taken too seriously. But Teller – and his new supporters in the SAC – was dead serious. The SAC had drawn up two target lists. Part I consisted of 3400 Designated Ground Zero (DGZs) targets. It was the sum total of all targets on the Soviet side as well as Eastern Bloc plus China. Part II consisted of 1209 DGZs targeted by a larger – still classified – number of nuclear weapons. About 76,000 kg of highly-enriched uranium and plutonium was available to fuel the atomic bombs and hydrogen bombs earmarked to inflict the desired level of destruction. That is an incredible amount of overkill against unarmed civilians. The SAC study does not include any explanation for why the civilian population was being targeted, but it does provide a chilling peek into the mindset of the US military and political leadership. It was “likely a legacy of earlier Air Force and Army Air Force thinking about the impact of bombing raids on civilian morale”, says the National Security Archive. For example, in a 1940 Air Corps Tactical School lecture, Major Muir Fairchild argued an attack on a country’s economic structure “must be to so reduce the morale of the enemy civilian population through fear—of death or injury for themselves or loved ones – they would prefer our terms of peace to continuing the struggle, and that they would force their government to capitulate”. The only likely reason the mad scientists – and their military fan boys – did not have their wishes granted was the lack of a delivery system for a bomb with a yield of 10 gigatons. But that did not prevent Teller from wanting doomsday weapons that could be delivered by missiles or aircraft. In another outburst, in the early 1960s, he suggested yields up to 1,000 megatons. It was still too big for American rockets but a 25 megaton bomb, the B-41, had the largest yield of any weapon in the US stockpile and it stayed in service until the 1970s. To get an idea of the size of these weapons, click here for images of the B53, 600 times more powerful than bomb that flattened Hiroshima. As large as a minivan, it was dismantled in 2011. To be sure, the Russians weren’t sitting idle. The American hydrogen bomb test on October 31, 1952 not only intensified the Cold War but placed the Russian atomic programme into high gear. Although the Americans were the first to go nuclear, Russia caught up and then overtook the US. Led by Andrei Sakharov, Russia tested its first fusion-based device on August 12, 1953 in central Siberia. The bomb had a yield of 400 kilotons. Though not nearly as powerful as the American bomb, it was a more practical weapon because it was small enough to be dropped from an airplane. Everything about the Tsar Bomba test was of a gigantic scale. The 26-feet (length of a minibus), 27,000 kg devise was so large that the Tu-95 Tupolev strategic bomber’s bomb bay doors and fuselage fuel tanks had to be removed. The bomb was attached to an 800 kg parachute, which gave the aircraft as well as an observer Tu-16 plane time to fly about 45 km away from ground zero. The nature of the blast – 3000 times more powerful than the Hiroshima atom bomb – offered an indication of the Tsar Bomba’s true potential. People 100 km away experienced some third-degree burns and its shock waves could be felt as far as northern Finland located 1000 km away. Sakharov was right in wishing that none of his bombs were used in anger. If the Tsar Bomba was dropped over central England, it would have caused lethal radioactive fallout as far as Eastern Europe. Besides, it was impractical as a weapon. Although Khrushchev claimed he had a 100 megaton warhead in East Germany, transporting such a massive, bulging weapon all the way to the US would have pushed Russian strategic aircraft to their limits – not a safe method of nuclear delivery. Had only a few dozen of these megaton warheads been detonated by either superpower, the result would have been catastrophic for Earth. A full nuclear exchange of several thousand nuclear bombs would have reduced the planet to a lifeless wasteland. The scary thing about the Cold War was that while the strategic arms reduction talks did succeed in cutting the number of missiles and warheads deployed, the actual size of the bombs was never limited. Perhaps the best comment on the depressing nature of nuclear bombs was made by a Russian witness to the Tsar Bomba test. At first he saw a powerful white flash over the horizon and after a long period of time he heard “a remote, indistinct and heavy blow, as if the earth has been killed”.